He’s been playing guitar since he was a kid back in his native South Africa and after hearing his solo album it’s obvious that it’s paid off for guitarist Sean Mercer. 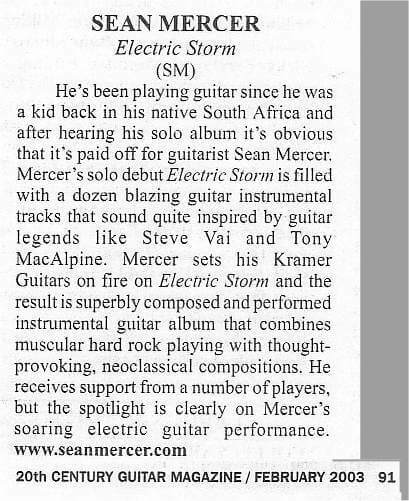 Mercer’s solo debut Electric Storm is filled with a dozen blazing guitar instrumental tracks that sound quite inspired by legends like Steve Vai and Tony MacAlpine. 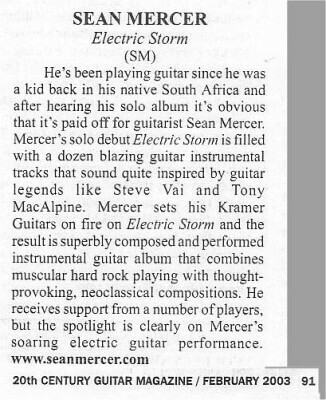 Mercer sets his Kramer Guitars on fire on Electric Storm and the result is superbly composed and performed instrumental guitar album that combines muscular hard rock playing with thought-provoking, neoclassical compositions. He receives support from a number of players, but the center spotlight is clearly on Mercer’s soaring electric guitar performance.